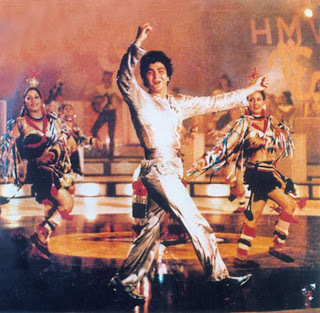 One of my favorite song types in Indian cinema is the 'performance item' ... where the hero or heroine happens to be a singer/dancer extraordinaire and does an elaborate stage show incorporating a host of sideys, props and dramatic set designs. Do you ever stop to wonder what these shows are and who the audience is? Who goes to these random stage shows and WHY? Is it just one 5-minute item? Are there breaks in between to change the sets and do costume changes? Is it all awkward in the theatre when the main artist does a close up of their expressions or goes off into a dream sequence in the middle (example: the song 'Payaliya' from Deewana -- the beginning and end of the song are a stage performance, but the entire middle of the song is a dream sequence ... soooo during the actual performance were Divya Bharti and Rishi Kapoor just standing there on stage?)? I know, I'm overanalyzing it. It's usually just a chance for the love interest to sit in the audience and admire the hero/heroine up there strutting their stuff. But being such a huge fan of light-up disco floors, I can't help but be fascinated by these stage performances. Hema Malini is indeed stunning, but the lady sitting between Dharmendra and Prem Chopra doesn't seem too charmed, despite the efforts put into their village backdrop. Three costume changes in this one ... I wonder what the audience did in between? Coffee in the auditorium lobby? This one is totally bizarre but I LOVE it. I mean WHAT was the audience invited to see here? I love the combination of the 'Spanish' dancers and the Indian dancers. The guys also crack me up in the audience. This is one of the most elaborate sets I've seen yet. Unfortunately this video doesn't show the weird intro in which Rishi and another dancer pose as great lovers of history and Rishi dramatically stabs himself (just part of the presentation, of course). I don't understand the occasion here but I would TOTES go see this show. I mean just look at that stage! This show is just plain weird, but I would totally go to this. I mean look at the crazy costumes on those background girls! Madhuri is completely entertaining from beginning to end too. Those sets are incredible and setting up between the different segments must have taken forever. I hope they served samosas in between. Maybe Sanjay Dutt's mullet entertained everyone while they were waiting. I absolutely love watching this video for the BIZARRE mulleted background girls. Each segment in this one has special props - flags, peacock feather fans and tinsel ... uh ... tinsel flag thingys. This is supposed to be the concert of some major pop star, and I would be so riveted if I saw this in a professional presentation. I want to have some serious discussions with the props person. I think pretty much anyone who paid for a show and saw Manisha Koirala dancing would demand their money back. She may be pretty, but dancing is NOT her thing. Even the light-up floor can't help her out here. I find the sets really confusing here ... first we seem to be in an ice cave or something, then we have a horse ranch motif with harem outfits, which makes perfect sense ... then we have our Egyptian set of course ... but the strangest part is actually the BACK of the theatre which has giant back lit drama masks and instruments. I think I WOULD pay for this show though, because I think Manisha needs the money to invest in some bras with better support. Here's another stage show supposedly for a school with sets that are beyond excessive. I mean they even have sand dunes for the first segment, then they MAKE IT RAIN inside the theatre ... how much would that cost?? And did the first few rows get rain ponchos like at Blue Man Group? Then they have wind machines and leaves for the last bit. What kind of school is this? I am so confused. There are so many more examples of these weird shows - ranging from the fantastic disco shows of the 80s to the full dramatic presentations like in Dil To Pagal Hai and Aaja Nachle. Hi Amaluu, It's some time I last came, and I just stumbled upon this very nice collection of "performance items" as you call them. I KNOW they're bizarre, even crazy if you try to rationalize them, but I'm sure like me you KNOW it's because they're crazy that we love 'em?! I loved your comments too. Your pretending confusion, or half-shocked appeal for Manisha's desirable investment... Sigh, this is Bollywood!!!!!!!!!!!!!! !